We are about to be bombarded with four years of anti-violence ads. Read this and you certainly get the impression it's all about men. The four-year television advertising campaign, due to start next month, is aimed at making domestic violence as socially unacceptable as smoking or drink-driving. If the aim is to make violence as socially unacceptable as drink-driving then we can expect headlines telling us Women's Violence is Increasing. Silly me. I forgot. We already have them. A commenter asked, Do you know the percentage of woman who got pregnant on the unemployment benefit and then went onto the DPB? My feeling is that some woman are choosing to get pregnant as a means of financial security, the statistics may confirm this. This is by no means the full extent as records only go back to 1993. 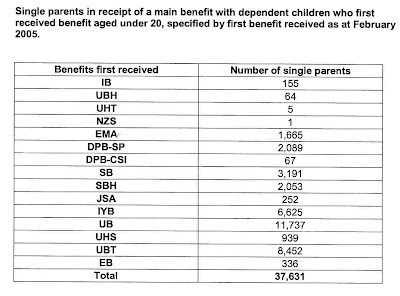 Most single parents currently on welfare, who started on welfare under twenty, started on an unemployment benefit - not the DPB. If income support is required during pregnancy, the sickness benefit applies. When I updated this figure in December 2006 it had climbed to 39,259. Back in 1999 the figure was 17,723. Get the picture? This is speculative. If you have good reason to believe I am wrong tell me why. 6 women spend ten months roaming a carpark thieving handbags and purses by duping trusting old ladies, one of whom reacts rather badly and may have died prematurely as a result. It could be these women stole what was left of her life. They certainly stole some of the quality. But that won't be all they stole. Over ten months it is quite probable they stole around $100,000 in benefits, supplements and allowances. That's a conservative estimate given that these kind of people are often also involved in benefit fraud. Of course the law would argue with me. It would say these benefits are their legal entitlements. What a joke. Does anybody seriously believe that the benefit system is a safety net of last resort? It once was. And when you try to persuade people it needs to be returned to that state, that we critically need reform, the objections come thick and fast. One being, people will turn to crime if we don't give them an income. "NZ ranked no 2 in world peace survey"
"New Zealand's lofty position in the Global Peace Index (GPI) partly reflects its lack of internal and external conflicts and its very good relations with neighbouring countries, namely Australia and fellow member states of the Pacific Island Forum," the GPI reports says. It said the nation's political scene was stable and the index gave New Zealand very low scores on the likelihood of violent demonstrations and the number of homicides. NZ ranked 12th out of 38. The most recent figure available is 2.4 - only slightly better. Have the GPI mixed up 'high' and 'low'? One wonders. "Our principled stance contributes to New Zealand's reputation as a world leader in peace and security" Miss Clark said. Isn't it interesting that when UNICEF says NZ has a very high rate of child death from maltreatment at 1.2 per 100,000 there is a political storm and every man and his dog, including the PM, has a theory about a solution (most notably removing section 59) but now the PM is basking in this good news, happy to overlook that NZ's homicide rate is actually relatively high. In fact if you took the same countries as UNICEF used in the famous table that had NZ third highest for child deaths, our homicide rate would be 6th highest out of 25. Today Ms Clark has us down as a world leader in peace and security yet for the past few weeks she has been hammering on about New Zealand's appalling record of violence towards children. Draw your own conclusions. John Key spoke to the Hutt Valley Rotary last week. As reported by the Hutt News, one of the things he said was there was no way of getting out of our Kyoto commitments. To do so would make us "international trading pariahs". I was under the impression our biggest trading partner is Australia followed by the US. I have a confession. I am a compulsive number cruncher. I can't stop myself. Put a bunch of data under my nose and the urge to analyse overcomes me. Today the DomPost ran its usual drink-driving conviction stats but all at once. Lots of data! Fair sample size. Here's some absolutely useless information for you. Three-quarters were male. The most common occupation was "unemployed" at 13.5%. Sharing second billing were Builders and Students at 11.5 percent each. Teenagers made up 29 percent and 20-25 year-olds 23 percent. So over half of all convictions were for people aged 25 and under. Most of the occupations are manual and a couple of more interesting ones were Lifeguard and Soldier. There were no Mayoral Candidates. Here's an interesting character running for Mayor in South Taranaki. Has spent time in prison for cultivation of cannabis (though he never used it himself), has three drink-driving charges and one charge of assaulting his wife (I only pushed her into a chair). Too many excuses for my liking. BUT why is he standing for Mayor? I don't know. And I'd like to. The newspaper is under no obligation to tell us. He went to the media to lay his past out before someone else did. They were not seeking an interview with him. Do you think that whoever wrote the story up might have sought to give us something beyond all the reasons why people shouldn't vote for the guy? 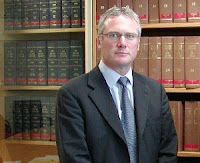 The shameless Peter Dunne. His toadiness is breathtaking. What kind of people vote for this man???? National's fortunes are on the rise and Dunne conveniently discovers his deep dissatisfaction with the way Labour have been treating him. "What is the point of being the loyal and dutiful one when the other party is out there playing fast and loose with the field? "To use the analogy of a marriage, there comes a time even in the most stable and productive of relationships when the wandering eye of one partner ceases to be just an annoyance and becomes a major problem." Poor Peter. He should take a leaf from the Lionman's book and next time he finds H1 cavorting with Jeanette and Winston, slap her hard. That would do a lot more for his popularity ratings than playing it haughty and hard-done-by. But just who is the two-timing tart here? There's Minister Dunne, still enjoying the fruits of his 'marriage' to Labour while making overt overtures to a younger, better looking, prospective partner. He has the morals of Henry the Eighth. Audrey Young's column in today's NZ Herald has the PM sounding mawkishly sorry for herself. Treating the avalanche of schmooze for John Key as a D for effort she says;"I can't work harder. Perhaps I could work smarter." Everybody knows how hard you work Helen. Give it up. Now. "I know that the Government standing very firm on the spirit of the changes to section 59 undoubtedly hurt us," Helen Clark said, "but in all conscience there was no way that I could have led a party that didn't support that change." She had been motivated by the appalling rate of death and injury to children "and when you have the opportunity to do something about it, you can either take that opportunity or curse yourself for the rest of your life that you didn't act. So, she is spelling it out again IN CASE YOU MISSED IT. The majority of us, who failed to support the change, are indifferent to the cruel, intentional injury and death of children. We are without conscience. Somebody needs to take that spade off her - quickly. Listen up Labour strategists. According to the NZ Herald the landslide of approval for John Key has little to do with the anti-smacking compromise which over half still dislike and everything to do with women liking Key. No party is comfortable changing horses when it is in front; there is too much to lose. But Mr Key's ascension appears to be all gain for National. The party is polling much better with women and now heads Labour for the female vote in the poll published in the Weekend Herald. But the difference is less than four points, whereas National has a 25-point lead among men. A marked gender divide has developed in our politics. There is now no discernible difference between National and Labour policy so what (most) women want is Labour's policies with a new leader - preferably younger, better looking and of the opposite gender to the current one. It's a no-brainer. I know faces. Maharey will get better looking as he ages. Think Paul Newman. Same colouring and skin tone. He also has an air of tragedy about him - women love it - and has proven he can swear with the best of them. Plus, according to my husband who, many moons ago, worked on his campaign team in Palmerston North - "he's a helluva nice guy". Key is lop-sided and unremarkable. Symmetry is everything. Nice enough smile but lets face it, his current competition is very weak. Yes. We could certainly stand more of Steve on our screens every night. And as Minister of Broadcasting he could surely wangle his way onto Dancing with the Stars. What a dream. That would clinch it. Goff could do the gravitas stuff to keep the men happy thereby dispensing with the dreadful Cullen. Meanwhile Steve will be out and about helping the ladies swoon their way the to ballot box. Perfect. "Disability benefit costs double as fraud soars"
That's a headline from the UK Telegraph. When Labour came to power in May 1997, 1.9 million people received DLA . By last November, the number of claimants had risen to 2.85 million. On investigation I find DLA (Disability Living Allowance) claimants could be children or pensioners. So for a better comparison to NZ, I'll use working-age incapacity benefit recipients of which the UK has 2,673 million (many of whom will be claiming DLA). In NZ in May 1997, 78,500 people received a sickness or invalid benefit. By last November that had risen to 124,600. The UK has more incapacity beneficiaries per capita BUT their number has been steadyish since 1999. Ours has grown substantially. Overall the UK has 8.8 percent (5,331 million) of its total population on some sort of working-age benefit. We have 6.5 percent. But we have many more single parents on a benefit per capita (2.2 compared to 1.3) which doesn't bode well for the intergenerational factor.